Bhaktimarga Swami Featured in Article from the East Coast! ~ The Toronto Hare Krishna Temple! 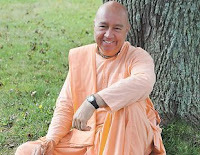 Bhaktimarga Swami Featured in Article from the East Coast! NEW GLASGOW – Clad in a bright orange robe and wearing sneakers, a Hare Krishna monk is walking through Pictou County this weekend as part of his fourth trip across Canada. The Ontario-born Bhaktimarga Swami, now 53, joined the Hare Krishna in 1973 and adopted a Sanskrit name as part of his vows. Bhaktimarga, who began his travels in Newfoundland a week ago, averages about 30 kilometres a day and camps on the side of the road, preparing his own vegetarian meals. This weekend, he plans to stay with a friend in the county and hold a ceremony welcoming a Halifax woman in to the movement before continuing on towards New Brunswick.